79% vegetable fat spread with 31% sunflower oil and 28% rapeseed oil. Great new buttery taste. 100% plant goodness. Delicious for spreading, baking & cooking. Enjoy new Flora, great new taste. Contains Omega 3 & 6. Silky smooth and creamy tasting. 61% less saturated fat than butter. Absolutely no preservatives, artificial colours or flavours. Suitable for vegetarians and vegans. 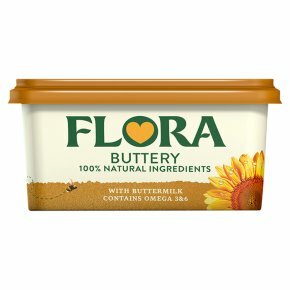 Flora Buttery; great new buttery taste with 100% plant goodness*. Flora Buttery spread is the indulgent choice for you and your family. Delicious and creamy taste, with 100% plant goodness*, what's there to not love? Spooned on top of fluffy new potatoes, soaked into hot cross buns or generously folded in cake batter, Flora Buttery is suitable for every occasion. *Naturally contains Omega 3 & 6, which contribute to the maintenance of normal blood cholesterol levels. A daily intake of 2g alpha-linolenic acid and 10g linoleic acid is needed. 2 x 10g servings of Flora a day contribute a significant amount to this. Enjoy as part of a healthy diet and lifestyle.